Advertising & Publication Design The history of M. Knoedler & Company, founded in 1846, spans the rise of the art world in America, and by the dawn of the Twentieth century, Knoedler & Company had played a pivotal role in the formation of many of our nation's most important public and private collections. 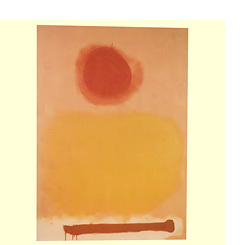 Knoedler champions the art of our time, representing and exhibiting a select group of post-war masters and contemporary artists, estates, and foundations. Design Latitudes was retained over an eight-year period as design consultants dedicated to the development and implementation of a comprehensive exhibition publications and advertising program which consisted of more than 900 projects. At the inception, Rubin suggested, "If you're going to err, do so on the side of being bold, colorful, and expressive," which we took to heart. We evolved graphic concepts that were formed from the nature of the artwork, conveying a rich sense of the artist's personality and touch. For an early show of Adolph Gottlieb's Major Paintings, we prominently featured his simplified representations of discs and winding masses. His paintings are variations with these elements arranged in different ways which we highlighted in the Art in America advertisement and the exhibition catalogue. 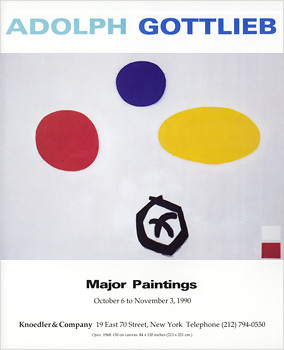 Gottlieb is considered one of the first color field painters and one of the forerunners of Lyrical Abstraction.